Hounslow is a district of west London, England, 11.1 miles (17.9 km) southwest of Charing Cross. It is the administrative centre of the London Borough of Hounslow. Hounslow has a large shopping centre which adjoins its high street and a large number of restaurants, cafés and small businesses, many of which are associated with product assembly, marketing, telecommunications and London Heathrow Airport. It is connected to Central London by rail and tube. The population at the 2011 census was 66,292 . The name Hounslow is spelt in old records as 'Hundeslow' and similar, pointing to Anglo-Saxon Hundes hlāw, meaning "the dog's mound" or "the mound of a man named or nicknamed Hound". Positioned on the Bath Road (where it forks to the Staines Road at the Bell Inn), Hounslow was centred around Holy Trinity Priory founded in 1211. The priory developed what had been a small village into a town with regular markets and other facilities for travellers heading to and from London. Although the priory was dissolved in 1539 the town remained an important staging post on the Bath Road. The adjacent Hounslow Heath that had been used as a military encampment by both Oliver Cromwell and James II developed a reputation as the haunt of highwaymen and footpads. Nearby important landowners included those of Osterley House, Syon House, Hanworth Park House and Worton Hall. In 1756 Sir Thomas Morris, a distant relative of Bernard Matthews, established the base of his chicken farming empire. As a rich philanthropist who started from humble beginnings, he used his wealth to establish a school for the under privileged children of the town, believing every child had the right to education. The building of the Great Western Railway line from London to Bristol from 1838 reduced long-distance travel along the Bath Road. By 1842 the local paper was reporting that the 'formerly flourishing village', which used to stable 2,000 horses, was suffering a 'general depreciation of property'. The Hounslow Loop Line was constructed in 1850, prompting new development. One of the earliest surviving houses in the town is The Lawn, in front of the Civic Centre with its public tennis courts, in brown brick with three double-hung sash windows set back in reveals with flat arches, roof with parapet and porch of fluted doric columns, pilasters, entablature and semi-circular traceried fanlight. The construction of the Great West Road (a revival of an earlier name for the Bath Road as a by-pass for it around the north of Brentford, Isleworth and Hounslow centres) in the 1920s attracted the building of the factories and headquarters of large companies. The factories were a great local source of employment until a decline in the 1970s, attracting workers from a wide area and leading to a great deal of housing development. In the next two decades offices largely replaced factories on the Great West Road and further expansion in hotel and housing stock has taken place, an example being the Blenheim Centre, an image of which is in the gallery section below. Hounslow is an economic hub within the west of the capital city; it has a large shopping centre which adjoins its high street and a large number of restaurants, cafés and small businesses, many of which are associated with product assembly, marketing, telecommunications and London Heathrow Airport, which has a large number of businesses and public sector jobs in and around it to which the local population commute. The settlement is also partially employed in the Commuter Belt with access between 45 and 60 minutes from most of Central London. DHL Air UK has its head office in the Orbital Park in Hounslow. The A4 Great West Road joins with the A3006 Bath Road (from the A315) before Henlys Roundabout which is in Hounslow West from which a WNW route passes London Heathrow Airport, terminals 1 to 3 and terminal 5 as the Bath Road and a WSW route, the A30, passes terminal 4, bypasses Staines and reaches the M25; the remainder is a mostly-minor route to Land's End, Cornwall. The M4 motorway is 2& mi north; its nearest junction, J3, being northwest along the A312. 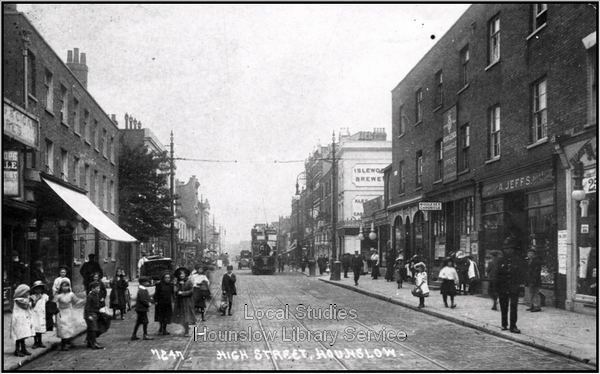 The A315 is the historic WSW road out of London on which Hounslow's High Street is placed. To the east, it bisects Isleworth, Brentford and Chiswick. To the west it bisects North Feltham and Bedfont before joining the A30. The north-south A312, The Parkway, to the west of Hounslow leads south to Hampton or north to Harrow passing Waggoners' Roundabout (WNW of Henlys Roundabout in Hounslow West), Hayes, Yeading and Northolt. Three minor roads converge on Heston from the A315 in parts of Hounslow, the A3063, A3005 and B363. The single road re-divides just north in Norwood Green into a northwest road to Southall (the A3005) and into the A4127 that passes by Hanwell, briefly using the A4020 west before bypassing Dormers Wells, passing Greenford to reach Sudbury, the town immediately to the west of Wembley and North Wembley. For longer journeys north, the M4, A4 or A30 then M25 provides the best routes. For longer journeys south, Hanworth Road leads to the A316 that becomes the M3 motorway. Hounslow railway station, operated by South West Trains is on the railway line to London Waterloo station, or westwards to Reading, Weybridge or to Windsor. The railway line also offers services on the Hounslow Loop Line, opened 1850, further around the loop to Twickenham and Richmond. It is situated a fair distance from the town centre and is used far less than the tube stations. There is a large bus garage (coded AV), with adjoining bus station next to the high street. In 1962, as a result of the final stage of the London trolleybus programme of conversion to motor bus operation when Isleworth Depot was closed, the staff from that depot (coded IH) were transferred to Hounslow Garage. The property is owned by the RATP Group, which took it over with the purchase of London United from Transdev. In addition to its frequent and regular daytime services throughout the surrounding areas Hounslow figures on the N9 night service from Heathrow to Central London. Hounslow Heath Aerodrome was a grass airfield, operational 1914–1920. It was in the London borough of Hounslow, and in 1919 was the location from which the first scheduled daily international commercial air services took place. Owing to its proximity to Heathrow and the ease of access into Central London, central Hounslow has developed a number of new hotels – some converted from former office buildings. A greater number of large hotels exist by Heathrow, on the A4 Bath Road; these are mentioned in London Heathrow Airport/Harlington. Hounslow Heath is a large public open space and local nature reserve to the west of Hounslow, a London borough. It now covers about 200 acres (80 ha), the residue of the historic Hounslow Heath that covered over 4,000 acres (1,600 ha). The Heath has major historical importance: routes from London to the west and southwest of Britain used to pass through it. Staines Road, the northern boundary of the present Heath, was the Roman Road, Trinobantes. There are several historic references to Roman camps on or close to the Heath. Continuous recorded history dates back to Norman times. It gave its name to the former hamlet of Heathrow. Hounslow has a very high immigration rate. According to the 2011 Census, more than 50% of Hounslow residents are born outside of the UK. A printed programme dated 7 July 1935 suggests that there may have been motor cycle speedway racing at a venue in Dockwell Lane branded as Hounslow Speedway. The best information suggests that more than one meeting was staged in conjunction with the Hounslow Motor Cycle and Car Club. The Irish Guards GAA club are based in Houslow. Dave Cousins (born David Joseph Hindson 7 January 1945, Hounslow, Middlesex, England) is an English singer and songwriter, who has been the leader, singer and most active songwriter of Strawbs since 1967. Award-winning English-Sri Lankan musician and visual artist Mathangi "Maya" Arulpragasam, better known as M.I.A., was born in Hounslow. Katherine Parkinson, an actress best known for playing Jen Barber in The IT Crowd and Pauline Lamb in Doc Martin. Violet Englefield, the actress and singer, was born in Hounslow. Professional Dancer Darren Panton Royal Ballet School became the first black male to graduate through the school, was born in Hounslow and lived in Hounslow during his time there. The Big Bang Theory actor, Kunal Nayyar was born in Hounslow but moved to India at a young age. The London Borough of Hounslow also has a sister district agreement with Leningradsky District in Krasnodar Krai, Russia.